The OneNYC initiative is a dense, comprehensive plan to reduce garbage output, increase green energy, make roads safer, improve recycling rates, and divert organics from landfill. New construction projects can feature “techno-trash” solutions that are futuristic and efficient. Hudson Yards is a good example of such, adapting a proven technique from suburban banks, the pneumatic tube. A first in Manhattan, waste will feed into vertical tubes and be transported along underground pneumatic tubes to a dispensary on Twelfth Ave., resulting in a garbage-free occupant experience. It’s notable that this approach was successfully implemented in the development of Roosevelt Island over 40 years ago, resulting in the same garbage-free experience to its occupants. Futuristic to the side, most of the opportunity for zero waste lies within existing infrastructure and expanding/ improving tactics for trash collection and recycling. Offering single-stream recycling and eventually an equitable Save-asYou-Throw waste program. Reducing commercial waste disposal by 90% by 2030. 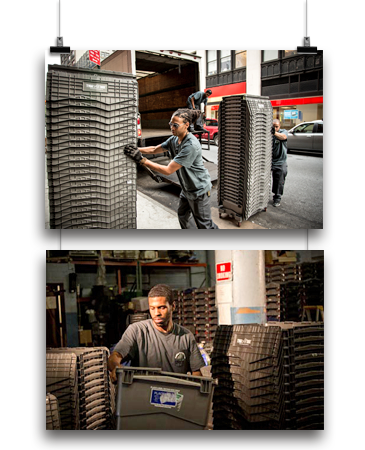 In order to reduce commercial waste by 90% by 2030 as stated above, DSNY needs to concern itself with the fact that 90 different private companies service the city’s 100,000 commercial businesses. The “Commercial Waste Zones: A Plan to Reform, Reroute, and Revitalize Private Carting in New York City” lays out a blueprint for the implementation of commercial waste collection zones across New York City, creating a safe and efficient collection system for commercial waste that provides high quality, low-cost service while advancing the city’s zero waste goals. The plan will divide the city into 20 zones, each served by three to five carters selected through a competitive process. This approach will reduce truck traffic associated with commercial waste collection by more than 60%, or more than 18 million miles per year, while strengthening service standards and allowing for customer choice. Infrastructure and Waste Management: Prioritize investments in clean, modern fleets and facilities that make up a reliable, resilient, and sustainable waste management system. For the most part however, in all the research I conducted with respect to tactics/methods for reducing/ eliminating waste, the simple, highly effective principle of reuse was barely mentioned. Reuse generates compounding economic and ecological benefits, eliminates the waste of financial, operational and planetary resources, and its results are guaranteed. 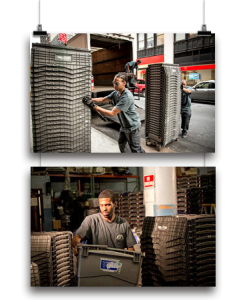 I know this from experience, having invented TygaBox, a simple reusable moving system with which we’ve saved our customers $100 million in moving costs, eliminated over one billion pounds of cardboard from landfill and saved 100 million trees. These metrics measure the powerful impacts of reuse, in this case, a simple box reused hundreds of times over its useful lifespan of 25+ years. I propose a shift in our mindset, our waste-management practices and how we reward cooperation/compliance. It’s common sense that increased reuse causes decreased demand. Accordingly, reuse reduces the waste stream, making it easier to achieve 2030 zero waste goals. ~Originally published in the 2019 March 19th issue of the NYREJ, author, Nadine Cino LEED AP, is the CEO and co-inventor of TygaBox Systems, Inc. and a regular contributor to NYREJ.